Somewhere along the way, we realized that this book would be more than a book. 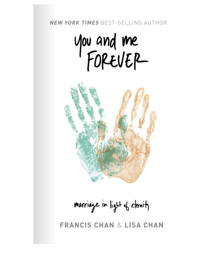 Francis and Lisa started writing You and Me Forever with the desire to point marriages back to Christ, and from the beginning they had been planning to give the book away for free. Shortly thereafter they decided to spend their 20th wedding anniversary serving with a friend's ministry in East Africa. While there, they saw real starvation as they fed children literally days away from death, and they also witnessed a system of poverty and prostitution that resulted in young girls having no other option but to sleep with about 5 men a night to make $5. Francis and Lisa were struck to the core by what they saw, so they decided to not only give You and Me Forever away for free but also sell the book to raise funds for their friend’s ministry and others like it around the world. However, rather than publish the book through traditional means, they took a big step of faith and decided to self-publish the book. In doing so, there was the potential to generate much more funds, for no longer would the publisher get the lion’s share of the profit, but there would also be substantially greater risk. Who knew if they would be able to pull it off? Well, as the Lord would have it, You and Me Forever was published only about eight months later! Thanks in a large part to the Crazy Love team and a great group of volunteers, now 100% of the profit from the book goes straight to this vision, with no publisher middleman, and we're well on our way to the $5 million goal. Since the beginning, You and Me Forever has been much more than a book for Francis and Lisa, and we trust that it may have been much more than a book for you as well. If you would like to share your story of how You and Me Forever has especially impacted your life, please share it with us here.